I never would have thought to make wraps out of the leftovers! Great idea! Glad this was a hit for you – using the leftovers in wraps was very clever. This was good Kitchen Therapy for you, right. And Wraps – brilliant. Who wouldn’t like to sop up tasty stew with a fresh crusty bread. Your kids are lucky. I love this stew too. Delicious and satisfying! A keeper no doubt . Have a nice day! What a great idea to use the leftovers in wraps! 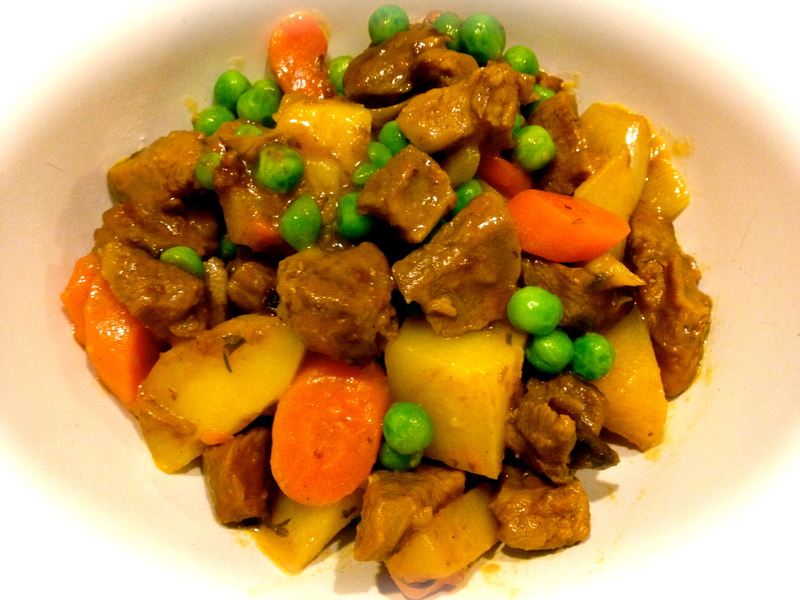 Very delicious looking stew! Have a wonderful weekend! I like the new name of your blog. And the idea of leftovers in a wrap. I was also think the leftovers would have made a nice filling for a savory pie. Yes this stew was so good it ranked right up there with m. Armagnac chicken – a might lofty ranking in my book! I’ve never fully understood why, but stew is one of those foods which always mysteriously tastes better the next day. Happy to hear that your kids enjoyed it for lunch. Your stew looks great! Glad everyone in the family liked it! I like your new name. The wraps are a great idea! I have tons of tortillas so I´ll give it a try today. I could use some kitchen therapy of this sort myself. Yum. Great job! It actually did taste great the next day, though I noticed the smell was stronger. Your stew looks great and so colorful! Your stew looks so pretty–like it was done by a kitchen stylist. I read once that when they take pictures of stews, they put marbles in the bottom of the bowl so the meat and vegetables rise to the top. I’m assuming you didn’t do that, or it wouldn’t have been a hit with the kids. short, but to the point 🙂 We served ours with the st germain biscuits and found it a complete delight! Your kids are so lucky, what a great school lunch!!! This looks delicious! I really loved this one too. I can see myself making it again and again.